Honey & Butter: The Perfect Chocolate Chip Cookie: Secret Ingredient! The Perfect Chocolate Chip Cookie: Secret Ingredient! It's taken many attempts, but I've tried various recipes, and found THE ONE. This moist yet crisp, perfectly sweet, chocolatey, heavenly chocolate chip cookie has a secret ingredient... see below. 2 teaspoons hot water <---- secret ingredient! Cream together the butter, white sugar, and brown sugar until smooth. Beat in the eggs one at a time, then stir in the vanilla. ---> KEY STEP: Dissolve baking soda in hot water. Add to batter along with salt. Stir in flour, and chocolate chips. Drop by large spoonfuls onto ungreased pans. Bake for about 10 minutes in the preheated oven (8-9 minutes if your oven is old), or until edges are nicely browned. I just made these. Used milk chocolate chips and mint instead of vanilla. My oven runs hot so I set it at 325• and baked for 8 minutes. They are the BEST cookies ever made!!!!! Cooked perfectly and taste amazing!!! Thank you for posting this recipe!! Super yummy cookies! 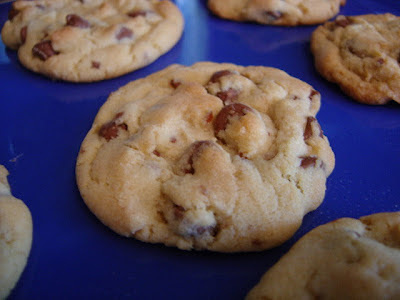 I've been looking for the best chocolate chip cookie recipe and I I definitely have found it. I made the cookies today and they came out perfect! Thanks so much for sharing the recipe!